I recently got a mailday from Upper Deck that made a significant impact on my Logan Couture player collection. I had to be very patient with this card, as it took quite a long time to get to me. Better now than never though! It all started when I got a door tag notice from FedEx. I wasn't really expecting anything so I had no idea what was coming, and no, Upper Deck doesn't really warn you when they send you big cards like this. I guess if you have a ton of redemptions out and continuously check your redemption statuses, you might have seen a card like this coming... but I hadn't. This was one of the very few redemptions I had with Upper Deck, and after more than I year, I had already stopped checking Upper Deck's redemption page long ago. Thankfully, I was able to receive the card on the second try by FedEx to deliver. FedEx usually delivers very late in the day for my particular neighborhood, so that works in my advantage as I can get home before packages like this arrive. Cards like this require that you sign for them, so I knew it had to be something big. This is my first shield card of Couture's. I unsuccessfully tried to bid on his Ultimate Collection shield a few years ago, and never thought that his 09/10 The Cup rookie shields were at a reasonable price. Plus, all the 09/10 The Cup rookie shields featuring Logan had him on the back! This one has him on the front and Patrick Marleau on the back. You can tell it's the back because it's the side with the foil serial number sticker. Is this my favorite Couture card in my collection? Well, actually no. My absolute favorite Logan Couture card is still his 09/10 Upper Deck Black 1/1. I love that thing. This card might be second... and if not there, then at least in the top five. My one issue with this card is that Logan's shield is placed a bit askew. Upper Deck could have done better for a card of this magnitude, but I won't complain too much. It's a great card, and I'm extremely glad to add it to my Logan Couture PC. 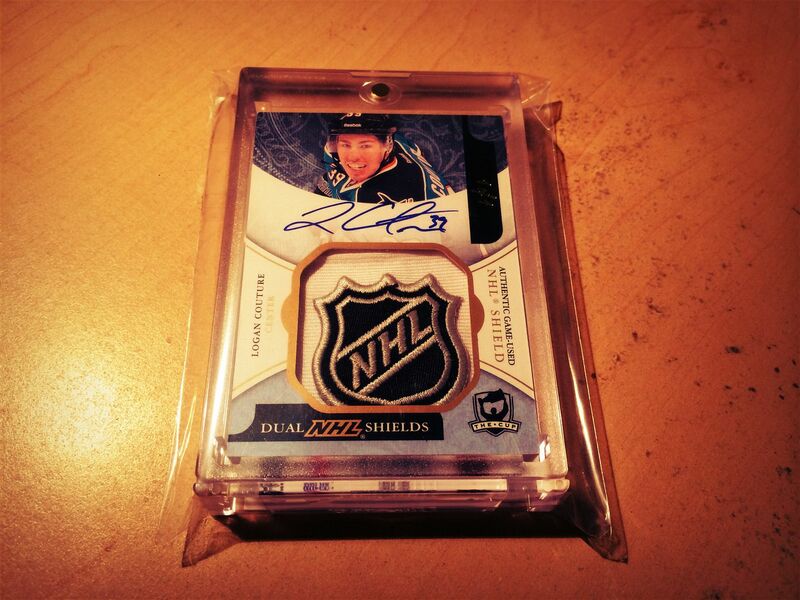 If you're interested in seeing my Logan Couture PC, I have a link to it on the right side of this blog site.